The Kids Made Me Fat: Happy Halloween! 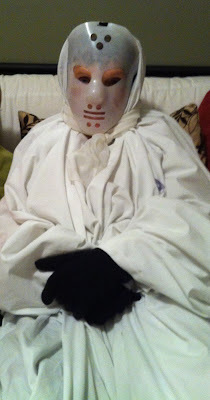 Yesterday, in preparation to scare my children, my 87-year old grandmother dressed herself in a white sheet and covered her face with a semi-transparent white hockey mask. She then drove across town, parked two blocks away and walked to my house - fully costumed. She then snuck in the back door and all hell broke loose. I'm quite certain Cameron will never sleep in her own bed again. She might very well be crazy but if this is what crazy looks like - sign me up. Crazy is so much fun. PS. Watch out locals - She's not finished yet. She'll be out on the town tonight - she wants to go 'spook' people.